It was a real fun and crazy last week for me in terms of being immersed in the world of locally grown food. On Wednesday morning last week on the way to the civic center farmers market (I still need to buy food unfortunately), I finally dropped by the 10,000 sq ft. temporary Victory garden across from city hall. The garden was built by a lot of volunteers under the guidance of Slow Food Nation (Alice Waters is the director), Victory Gardens 08, and City Slicker Farms. Here is what their PR says about it: “It will serve as a demonstration and education centerpiece leading up to and following Slow Food Nation, an event taking place in San Francisco over Labor Day weekend (August 29 – September 1, 2008). It will provide visitors the opportunity to learn about urban food production practices and demonstrate the potential of truly local agriculture. It is the first time that an edible garden will be planted in front of City Hall since 1943”. The food is going to the food bank right now (when I was there today to be a docent we picked leaves off of a lot of the plants and had about eight plastic bags of greens and basil. Then the food bank driver showed up with their big truck to pick it up, which seemed a little crazy in a way using so much gas to carry so small an amount of food). I am still trying to score some for the farm stand (which I think would be great because then I can talk to people about where the food is grown and let them know about the what is happening down there). I think the garden is very inspiring and everyone who is interested in gardens and growing food locally should visit it (the garden is open every day from 9-4pm). I think there should be a public campaign to talk city hall into making the garden permanent as a way to fight hunger in our city. If you really can’t go down there the web page about it is interesting (you can see photos of it being built). http://www.slowfoodnation.org/blog/category/victory-garden/ . Their blog is also interesting to read– http://www.slowfoodnation.org/blog/. In the middle of the week I picked up a big box of garlic and potatoes from my friend with the connection to the Garden Project at San Bruno Jail. I brought that to the stand on Sunday as well as a box of beets and broccoli from the Ferry Building farmer’s market. I also got some herbs, carrots, and greens through the same source. I picked salad greens from my backyard and the Secret Garden, and a few of our first tomatoes (I gave them away as a prize to people who brought their own bags) from Treat Commons and my backyard, green beans from my backyard, scarlet runner beans, some kale, a couple of trombone squash and yellow zucchini, a few flowers, and a few jalapeño peppers from Treat Commons.This week I grew several types of sprouts that I gave away. People are liking the sprouts and the sunflower greens. The best part of the stand was all the neighbors who came by with fruit and vegetables. On Friday a woman left some yellow plums with the club house park director. On Sunday, one woman brought more beautiful yellow plums, another woman showed up with about six apples from her tree, and another neighbor brought nectarines. Christy brought rhubarb and purple green beans. Dan came by with a number of the most attractive large summer squash called Peter Pan that he grew at his home nearby. I wish I had a photo of the hydrangea flowers that a neighbor who came last week brought by. It was a stunning bouquet of the biggest bunch of flowers ever. I didn’t realize hydrangea flowers make good bouquets. I do love to give away flowers to people. As I mentioned above, we had a lot of seedlings to give away and I have more plus the ones I am growing. A lot were planted in my backyard and the kids at the Secret Garden are going to plant a lot of corn and lettuce. And people take the seedlings and I guess are growing them at their homes. When I was in the park last week a young boy came up to me and said his tomato was growing tall and had green fruit on it which was real encouraging to hear. On Saturday I picked blackberries on Bernal Hill. Some were over ripe and many were not ripe at all. Some were perfect to pick and I collected 6 cups, some very ripe and some part ripe. It turned out I thought they were too messy to give away at the farm stand so I baked a vegan blackberry pie and gave people visiting the stand a small piece each. I used agave syrup and a little sucanat unrefined sugar, and it came out delicious, though a bit tart. It was pretty popular. I picked small plums at the Secret Garden. There are literally millions of them is my guess. Unfortunately a neighbor hacked away at the loquat tree I picked two times already in their yard and the tree in the Secret Garden over hanging into their yard, and so a lot of loquat fruit was lost. I guess they didn’t like the fruit falling on their concrete backyard. There were some way high up in the tree that I didn’t try hard enough to reach. I also picked some delicious green figs from a friend’s house. Also, a friend told me about a tree in our neighborhood that a couple of years ago that had large plums on it that all got wasted and were on the ground rotting. I was excited to try to find the tree and see if it had fruit this year. It was kind of feeling like going on a blind date, I found the street where the tree was supposed to live and I hunted around for it. In the process I discovered a park in our neighborhood that I heard about but never understood where it was (Juri Commons). I found the tree overhanging the fence bordering the park and it was love at first sight. And the fruit luckily wasn’t quite ripe yet. Maybe I can pick it next week. This was one of the thrills of my week and that probably show you how crazy I am. But getting to know your neighborhood and what grows there is truly fun and a joy. I like the idea of mapping out the fruit trees and berry bushes in our neighborhoods, and this has been done in other places. I actually started doing this years ago, but don’t know where my notes are for what I found. Here are two photos. One is a group shot of some of the people who showed up at the beginning to help or get food. The other is a picture of a mother and daughter holding two of the Peter Pan squashes. I think the woman and the squashes are both a turn on. One of the best parts of the farm stand is all the great people who show up. Toña the mom in the picture has been living in Mexico for 28 years in an ecovillage (ecoaldea huehuecoyotl) and is doing some great artwork. She showed me some copies of her corn paintings that are on display at the SomaArts Gallery for a few more days http://www.somarts.org/. Her daughter Laulin just moved here to go to San Francisco State. I told her San Francisco is a great place to meet people. My secret is to start some project that brings you into contact with a lot of people, like a garden or farm stand for example. Christiane and Ali came by to help with the stand and to work some on their permaculture class project of designing an expansion of the garden into the park. I think the class is over in a week. They now have a proposed list of things to plant that I am going to look at. Also, I met Dave and Joe who are also permaculture students designing a garden for the empty lot at 18th and Rhode Island. I learned that they want the garden to mainly produce food for the farm stand which is terrific. They also had the idea that if there was enough produce to possibly sell it to Whole Foods and give the money to the landlord so he can use it to pay property taxes. We got into a long discussion about my philosophy of doing things for free which I won’t go into here. My inspiration though comes from the Diggers (“the Diggers took their name from the original English Diggers (1649-50) who had promulgated a vision of society free from private property, and all forms of buying and selling.”). For more information check out http://diggers.org/ a site run by a friend. I think that the Victory Garden across from city hall, if not made permanent, should be moved to the site at 18th and Rhode Island, soil and all. 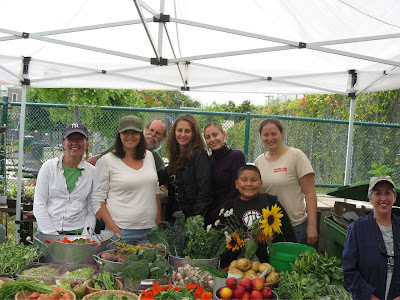 That the vision of growing local food on mini-farms and given away to the hungry and poor should be continued on a new site! I wonder if we in San Francisco have reached the peak of summer harvest season yet. Certainly the Treat Commons Community Garden is looking pretty green and lush right now. We are getting a lot of scarlet runner beans and the yellow zucchini are producing some squash. Some tomatoes are just starting to turn red. My backyard garden, having been neglected for two weeks looks pathetic in terms of what is growing and needs to be replanted. The Secret Garden is look pretty good now with a lot of kale growing and in maybe two weeks it will be ready to harvest. And of course the plum trees and loquats there have masses of fruit (though the plums are mostly bland and tiny and the trees need a lot of pruning and thinning). I know when you go to the farmers markets now they are overflowing with summer produce and I am starting to feel a little frustrated being an urban farmer and not having rows and rows of foods that I am growing at this time of year. Quite frankly it is embarrassing. I was thinking I should be an apprentice at some farm. I am really attracted to the work of John Jeavons who started a project called Ecology Action in Willits that has a mini-farm. He is famous for popularizing double digging and the biodynamic French intensive method of growing food. It is truly inspiring to me. His most known book is How to Grow More Vegetables. When I visited his place years ago I was impressed how seriously he takes food growing and also making his knowledge available worldwide, especially in poor countries. The table looked good though despite all my grumbling. We had scarlet runner beans from Treat Commons and purple and green beans from my backyard. There was a ton of salad mix from my backyard and the Secret Garden, and some from Treat Commons too. There were beets from the Ferry Building Farmer’s Market (I am pretty happy that beets are so popular!). From Treat Commons we also had a couple of yellow zucchini, some carrots (also some from my backyard), white sage (for incense), African Blue basil, a couple of cucumbers, some flowers, a few artichokes. I also harvested a lot of loquats and plums, and I brought some Cape Gooseberries from my backyard (see below). Also, Ariel (who put together the youtube video for the Bay Guardian) and her friend whose name I have forgotten brought by some herbs and some shiso seedlings that were a great contribution. I got a huge donation of organic kale from the County Jail Garden Project. Rita who runs the Mission Reading Program on 24th Street was looking for someone to give a lot of zucchini and tomato plants away to and I was alerted by a neighbor about this. So I picked up at least 20 plants in gallon pots and I found out they were grown by the Garden Project at the San Bruno jail. I have wanted to contact them for a long time and mentioned it to Rita. Then she called me on Friday and she had two big boxes of fresh delicious kale (my favorite vegetable) for our program. I managed miraculously to put it all in my refrigerator (plus giving away some to friends and neighbors) and brought it to the stand Sunday. I may be on the lookout for a free or cheap working and energy efficient refrigerator if this keeps up. I still had a lot of kale left over despite having given away a lot. So I cooked up a bunch of kale the way I like it best. Chop up the washed kale small. Chop up about two or three big cloves of garlic. Heat some olive oil in a wok and when the oil is hot throw in the garlic. The oil will soak up the flavor. Toss in the kale and stir fry for about five -8 minutes until the greensare soft. I add a dash of tamari and serve. Anyone know the name for kale in Spanish? I brought a basket full of a fruit I like a lot that I have always called ground cherries or husk tomatoes. I learned they have other names like Cape Goose Berry (Physalis peruviana). They seemed to have roused a lot of interest among farm stand attendees. One thing about the free farm stand is I realize how much I have to learn because people ask so many darn questions about things. I know that these fruits are easy to grow and that they are delicious, that they are related to the tomatillo, that they seem to be perennial around here and they reseed easily, and are in the Chinese lantern family, because of the lantern look of the fruit with it’s papery lantern like shell around the fruit. I looked up the fruit online and learned so much more. The article mentions different cultivars that sound wonderful. I want to get seeds for them and try them out. I really appreciate the opportunity to meet my neighbors and friends at the Free Farm Stand. It is hard to put it in words what community is and the value of it. But it certainly is a lot of fun and makes one feel good to get to know those people you live near and to have a chance to see friends in such a busy world. I liked getting the chance to hold Valentino yesterday, a tiny baby that is so cute, as cute as a cucumber. And it really is needed to feel positive in the city these days. For example, last week could have been a total bummer. Reading about some guy that was blasted away by a shotgun blast on Mission and 20th St. and then my slum landlord neighbor for some unknown reason hiring a nice guy to chainsaw our beautiful stand of rare bamboo down in front of our building (plus he did in the bougainvillea, jasmine and trumpet vine tree). It may not be on his property (I now have to research the property line). It makes one angry and sad and if it wasn’t for all the great neighbors who I meet over the years and my friends that I sometime get a chance to connect with, I would want to climb out of my clay shell and go somewhere else. I also was so happy to work with Corinne again who opened the stand last week. I am really a guy who likes to work with others and not be a one man show, so it is great to slowly build a team to run this project. She is moving to the city and I think she may be looking for some great non-profit job. I would recommend her for sure. Hopefully her new job will give her time to continue working with the farm stand. Here is a picture of two sisters that I have met relatively recently. Fillipa on the left works as the director of the clubhouse at the park and does such great work with the kids who go there for her programs. Andrea is her sister whom I am getting to know. Siblings like plant relatives are so much fun to be familiar with. Fillipa suggested I put up a sign in the neighborhood saying that I am available to pick people’s fruit trees. She knows of two neighbors with fruit trees that don’t get picked. I think I will do that and let people know that the farm stand will take any fruit as well as pick it. I decided to wait on the berry picking on Bernal Hill until the berries get more ripe. Anyone want to join my fruit gleaning team?